Nathan (left) and Michael Purdon have made a good start to their ownership/training partnership. 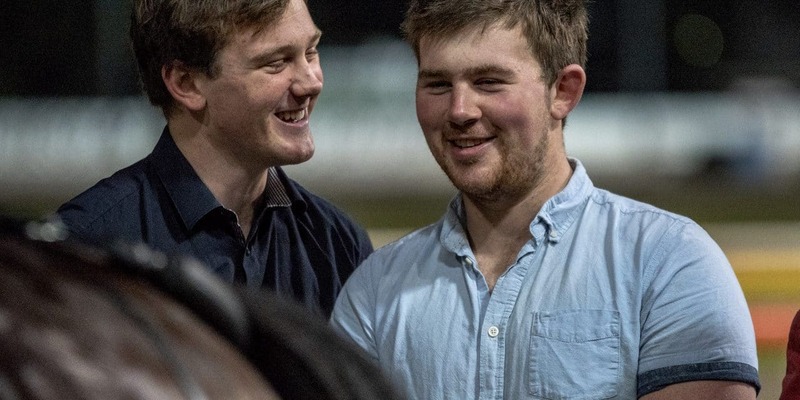 The training career of Michael Purdon got off to a great start with Major Trojan and now he’s set to make another good impression with juvenile trotter One Guz Hall. The Angus Hall gelding makes his debut in the two-year-old trot at Addington this week and will be Purdon’s first starter since Major Trojan lined up in the Sires Stakes Final on Cup Day. Purdon and his brother Nathan co-owned Major Trojan and had sold him for big money to the Gary Hall stable, for whom he has since started three times for two seconds to the smart Eloquent Mach and a third to the same horse in the G2 Western Gateway in Perth last Friday night. The Art Major colt lines up in the WA Derby Prelude at Gloucester Park this week. One Guz Hall made a very good impression when he won an Ashburton trial last week, crossing from post five to lead at the start in the six-horse heat and fighting off the trailer Bemus Point, a Majestic Son-Inspire filly who also makes her debut for trainer Regal Todd this week. She has drawn in barrier four and one place inside One Guz Hall. “One Guz Hall has been very solid in his gait at the trials although you never really know what these young trotters are going to do when they get to the races,” said Purdon. “He got lost in front last week, but when Nathan asked him for a little more, he found plenty. The speed was really only on in last week’s trial from about the 500m and the pair drew clear of the rest during a final quarter in 27 seconds. While Nathan has gone to work for Cran Dalgety to further progress his driving career, Michael has been setting himself up as a trainer at Grant Payne’s stable and has three two-year-olds and six yearlings on the books at this stage. One of the other two-year-olds is Ringo’s A Star, a Bettor’s Delight-Blackbird Fly gelding who won a workout at Rangiora on Wednesday. Purdon owns that one himself after buying him at the Premier Sale for $23,000. “Dad (Mark) had him marked in his book although he didn’t quite make his top 10, so I just went on his judgement. One Guz Hall also came from the Premier Sale although he was passed in by vendor Lex Williams. Another one that was in Cracker Hill won his debut at Winton last Saturday, while the one that wasn’t was Ultimate Stride, who topped the trotting sale at $160,000 and who was second on debut at Addington last Friday night. Williams also offered two pacers at the Premier Sale and one of them was Flying Even Bettor, a $90,000 purchase who won the Kindergarten Stakes this month after finishing a neck second to Smooth Deal in the Sapling. So of the five yearlings that Williams offered at the Premier Sale last year, it looks like four of them could easily be two-year-old winners this season. The two most expensive ones look like being very good and this week will tell a story about One Guz Hall.